Here are free Excel calendars for downloading. Twelve months on one sheet or one month per tab. This hilarious clock is the perfect accessory for any Excel power user. 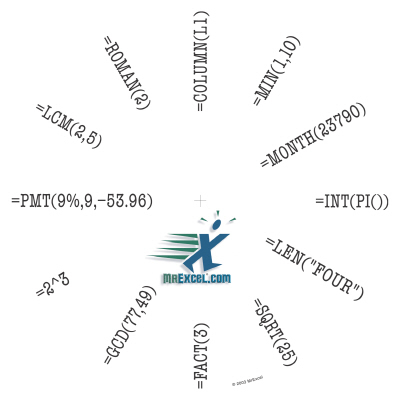 Each numeral has been replaced with a suitable Excel function that will evaluate to that numeral. We've used one function from as many function categories as possible to really provide a broad range of functions. Hold down the ALT key and move the mouse until the pointer arrow is on the border of the selection. When the arrow touches the tab, Excel switches to the desired worksheet. Now drag the selection to the correct position. Let go of the mouse and then the ALT key. To copy data hold down the CTRL+ALT keys and perform the steps above. BTW the screen will not scroll while you hold the ALT key down. I have to admit that I have not caught the fever that these puzzles seem to have generated. Most every newspaper in the world has started publishing these brain teasers. "Sudoku , sometimes spelled Su Doku, is a logic based placement puzzle, also known as Number Place in the United States. The aim of the canonical puzzle is to enter a numerical digit from 1 through 9 in each cell of a 9x9 grid made up of 3x3 subgrids (called "regions"), starting with various digits given in some cells (the "givens"). Each row, column, and region must contain only one instance of each numeral. Completing the puzzle requires patience and logical ability. Its grid layout is reminiscent of other newspaper puzzles like crosswords and chess problems. Although first published in 1979, Sudoku initially became popular in Japan in 1986 and attained international popularity in 2005." Here is a download that will construct as many of these puzzles as you might be Jonesing for. Betty C Jung has put together a serious collection of tutorials, links, and data sources. You could tell when Lotus was being taught by the instructor's chants of the multiple keystrokes. "Slash, F, Down arrow, Return, Slash, . . ."
"Another feature that illustrates 1-2-3's human-engineering design is its jargon-free prompts, explanatory messages, and fail-safe mechanisms. Suppose I want to delete a spreadsheet file. When I type "/F", I get a menu of possible file actions, the first of which is in inverse video. I can execute any action by either moving the inverse video cursor to that action name and hitting the Return key or hitting the key that is the first letter of the action name. If I hit the right-arrow key until the action name "Delete" is in inverse video, I get an explanatory note immediately below the command line that says, "Delete a worksheet, print, or graph file" ("worksheet" is Lotus's name for a spreadsheet). That's what I want to do, so I conveniently hit Return. The inverse video cursor is already positioned on the option I want, "Worksheet", so I hit Return again. 1-2-3 now reads the current disk and gives me a menu of all the spreadsheet files by name. I then move the inverse video cursor to the spreadsheet I want to delete and hit Return again (there's no need to type the file name - just point to it). 1-2-3 displays two options, "No" and "Yes", with the cursor on the "No" option and an explanatory note, "Do not delete the file". By moving the cursor onto the word "Yes" (which includes the note "Delete the file") and pressing Return, I can delete the spreadsheet file. Wouldn't you like a piece of software that does all that for you?" Lotus was another application that missed the Windows train. "Excel now dominates the spreadsheet world, but once upon a time there was actual competition among spreadsheet products. This program looks at Quattro 1.0, Allways 1.0, Lotus 1-2-3 3.0, Ashton-Tate's Full Impact, and Excel 2.1. Guests include Gary Kildall, Jan Lewis, and Jared Taylor of PC Magazine. Originally broadcast in 1988." One of the problems expressed in this program, was that you needed to run Excel on a 286 or 386 machine. 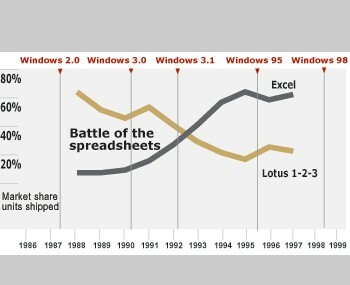 "The rise of Microsoft Windows in the personal computer market was accompanied by the rise in Microsoft's competing spreadsheet, Excel, and it gradually usurped the position of 1-2-3. Being loyal to OS/2, Lotus was slow to embrace Windows. Additionally, several versions of 1-2-3 were available concurrently, each with different set of functionality and slightly different interface." Here is the original PC spreadsheet program. You can download it, play with it, and then run back to Excel. You can easily insert an automatically updated stock quote for a specific company in a spreadsheet. Click the Smart Tags tab and place a check beside Label data with smart tags. 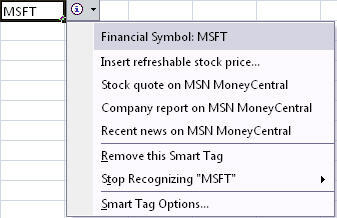 Type in a Stock symbol (such as MSFT) in a cell. Click outside of the cell. Place your mouse cursor over the purple triangle in the lower-right corner of the cell. Click Insert refreshable stock price. Select whether to insert the stock price on a new worksheet or in a specific area on your current worksheet. You can refresh a stock quote price at any time by right clicking anywhere within your worksheet and selecting Data Range Properties. Enter a value for how often the stock quote price should be refreshed. When Office 2003 first came out, one of the new features was that the help files were "live." Rather than using stale information installed years before, the application connected with Redmond for the newest and best solutions. This can be a problem depending on how you connect to the Internet. If you're using a dial up service, or speeds slow to a crawl. Here is a way to use local information. 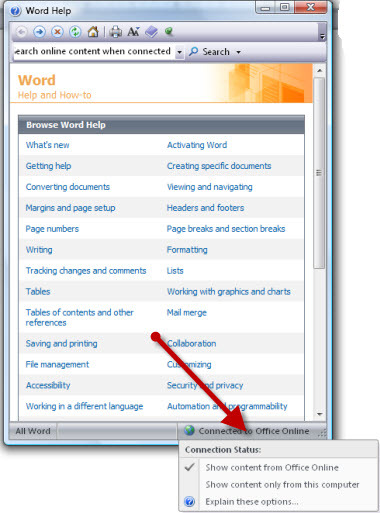 At the bottom of the "See also" box there is a hyperlink: "Office Online Settings"
Uncheck the option: "Search online content when connected"
Office will now use the help files on the local hard drive. It is much faster! Be aware that if you do turn it off, you might miss some of the Office online feature, like tutorials and downloads. If you have a column of data, you may wish to insert a new formula on each row, number the lines, or add a date column. To fill the column down to the bottom of the database, just double-click on the fill handle - the tiny square at the bottom right corner of the active cell. The duplication continues as long as there are entries in the adjacent column. If you wish to fill down a series, make at least two entries so that the interval is apparent. For instance if there is a column of data in A1:A400, enter the number "1" in B1, "2" in B2. Select B1:B2. Double click on the fill handle and Excel will fill the series down to B400. You can also select a longer series, such as the name of a supervisor and the team members. Format the supervisors name differently, if you want. Select the list and double click the fill handle. The list will be repeated down the page, as long as there is a corresponding entry in an adjacent column. The formatting will also be repeated. Click Options on the Tools menu and click the Edit tab. Select or clear the Allow cell drag and drop check box. You might like to distribute a short PowerPoint slide show, and include some extra material. Arrange the windows so that both applications can be seen. (Right-click an empty area of the Task bar and choose "Tile Windows Vertically." Type your introductory text in the Word document. Switch to PowerPoint and open the PowerPoint file. In Slide Sorter View, hold down the Ctrl key and select the slides you want to include. Drag the selected group of slides onto the Word document. You will only see the first slide in the document, but if you double-click on the image, the PowerPoint show will run. It will also work in Excel. Try this experiment. On a sample worksheet, enter some arbitrary data in say the A1:B5 range. Select the C column and format it as Text. The formula is filled down the column as long as there is data in an adjacent column. But wait! I don't see the value. I see the formulas! In addition, the formulas are still in lower case and the relative references have not been updated. Easy to fix, I hear you say. Just reformat the column as General. To fix the problem, make sure the column is formatted as General. Select the first cell. Click in the formula bar and hit the Enter key. Now double click the Fill handle. The reverse also causes a problem. In a column formatted as General, enter some formulas. Now reformat the column as Text. The formulas still work, but if you edit one of them, it reverts to a text display. One of the first things people do with Excel is make lists. Next they attempt to set up a budgeting worksheet. Michael Ham has a free downloadable budget spreadsheet. The formulas are protected, but you might consider it an exercise to figure out how they work. Just your take-home pay, which is what you control and spend. A reserve equal to 3-6 months of take-home pay. A portion of your income set aside to fund your retirement. Expenses that you must pay over the course of a year. You also must pay to replace things that eventually wear out. Partly discretionary, partly not; paid by cash from your pocket. Discretionary purchases paid by check periodically. Big-ticket discretionary purchases that you must save for. A summary of your income and where it goesâ€”and where you are. You can switch to this format once you're familiar with the method. Ideas to help pare your expenses. If you're going to do this frequently, go to Tools>Customize. Choose the Commands tab and locate Camera in the Tools category. Drag to place the Camera button on your toolbar. Clear cell gridlines if you do not want them displayed in your picture. You can use the Picture toolbar to change the image. To paste information you've copied from another program as a picture in Microsoft Excel, hold down SHIFT and click Paste Picture or Paste Picture Link on the Edit menu. You can, also, create a dynamic linked text box by using the tool on the Drawing toolbar to place the object on the worksheet. Now click to the Formula box. Type = and the click on the cell you wish to link. The process is a little different in 2007. Either add the Camera tool to the Quick access toolbar, or just select the range and drop down the Paste options. Next pick a location and choose Paste as picture. When a company accumulates a great deal of information, it becomes un-wieldy to work with just basic Excel or Access databases. There is a database concept called on OLAP cube (On-Line Analytical Processing). This multidimensional collection of data can be thought of as a 3-D pivot table viewed from flat land. Just What Are Cubes Anyway? Joe Chirilov presents a spreadsheet solution to a friendship breaker. Recently a large group of friends and I went on a multi-city tour of Europe that lasted a couple weeks. There was a lot of planning that went into this trip and responsibilities for booking different legs of the trip were spread out across the group. How do you efficiently handle paying back multiple people while getting reimbursed for your costs at the same time? "IT may be the biggest tool in the Office, but Microsoft Excel can be cool too"
Here's an article on off-prescription Excel. A few links to sites with advice on spreadsheet design and error detection. Excel has had a feature called web query. Here's an add-in that makes it a little easier. 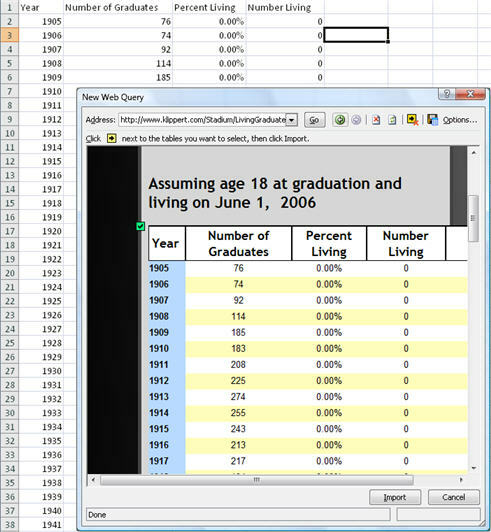 "The Excel 2007 Web Data Add-In makes it easy to use a Web page as a data source in Excel. 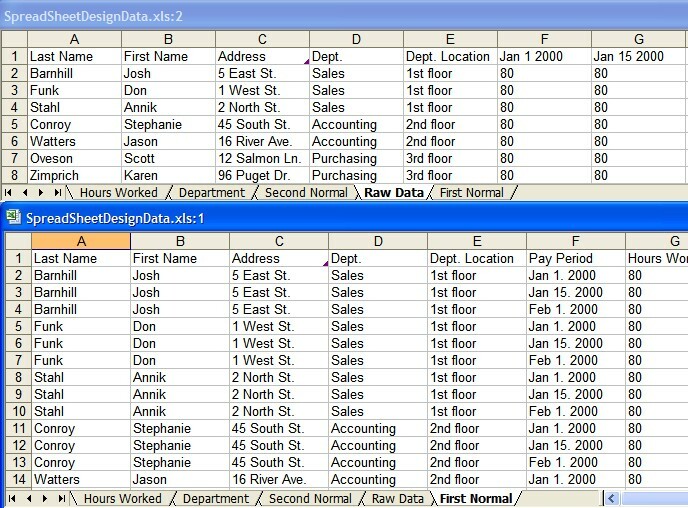 The add-in plugs into Excel 2007 seamlessly, its entry point located on the Data Tab under the From Web option. The system extracts data by learning from a userâ€™s selection of data they wish to capture into Excel. The more selections, the more the system is trained." How to turn on smart tags. Smart tag functionality is turned off by default. Before you can use smart tag functionality, you must turn on smart tag recognition. To do this, follow these steps, as appropriate for the version of Excel that you are running. In the AutoCorrect dialog box, click the Smart Tags tab. Click to select the Label data with smart tags check box. 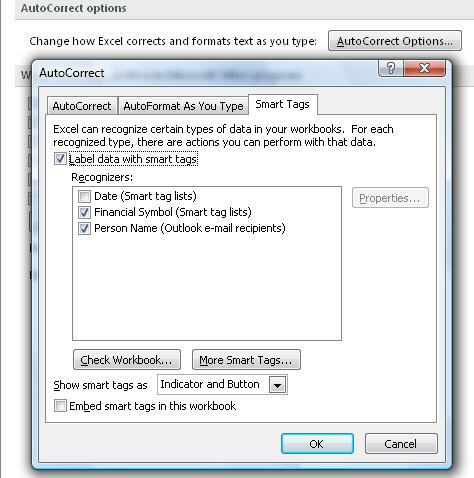 In the Recognizers box, click to select the check boxes next to the specific smart tag recognizers that you want to turn on, and then click OK.
Office.Microsoft.com has a short demo that shows you the main things anyone needs to know about Excel. There are many thousands of users who find that this is all they ever need. There's a lot of information out there. The problem is how to find it. 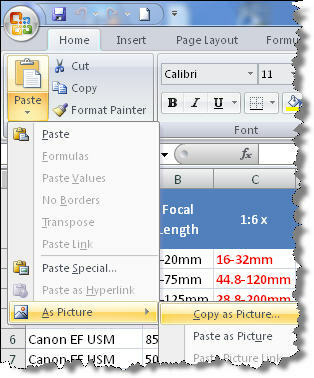 Office 2007 uses OfficeArt to format text boxes, graphics and pictures. It's available in Word, Excel , and PowerPoint, but it is most active in PowerPoint and Excel. Bastien Mensink, from the Netherlands, runs ASAP-Utilities.com. He has aggregated the headlines from a number of Excel Blogs. If you don't have them as part of your RSS list, you should. Lots of limits have been changed with 2007. The size of a worksheet is now 1,048,576 rows by 16,384 columns. The number of undo levels has gone up to 100. In Excel 2007. the number of levels of the "undo stack" was increased from 16 levels to 100. Setting AutoFilters, showing/hiding detail in PivotTables, and grouping/ungrouping in PivotTables are now reversable. And the undo stack is not cleared when Excel saves, be it an AutoSave or a Save by the user. Close any programs that are running. In the Edit DWORD Value dialog box, click Decimal under Base. 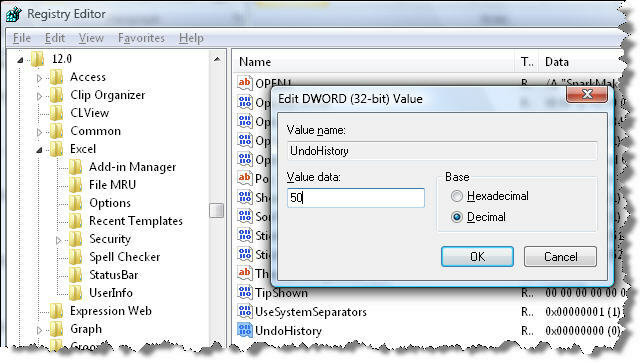 Type a value between 0 and 100 in the Value box, click OK, and then exit Registry Editor. Start Excel. Excel stores an undo history for the number of actions that you specified in step 6. Here and there you pick up a lot of odd files. Some of them maybe for programs that have long since been sent to the great Recycle Bin. There is a web site that will convert a great many file formats up to 150mb. Convert files into universal formats like Adobe PDF, PS (PostScript) or CSV to print, fax or simply read them on any computer, without special software. You can check which version of the Microsoft Office program is installed on your computer, and you can determine the product ID number of your copy of the program. You can also get information about your computer. Cick Access Options, Excel Options, PowerPoint Options, or Word Options. About Program Name, click About. 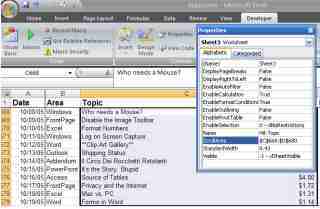 Note Program Name is the name of the program you are in, for example, About Microsoft Office Word 2007. 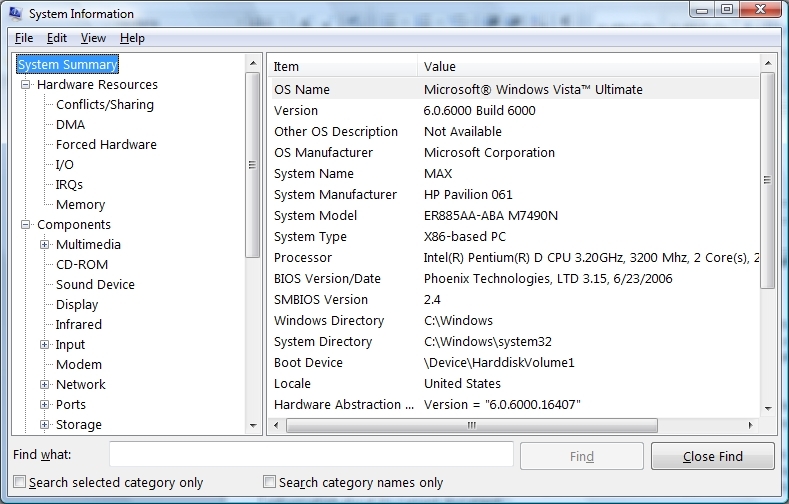 To see information about your computer, in the About Program Name dialog box, click System Info. In Word it's easier, just hit Ctrl + Alt + F1. Require a relational database (multiple tables) to store your data. Might need to add more tables, in the future, to an originally flat or nonrelational data set. Keep a very large amount of data (thousands of entries). Keep data that is mostly text. Rely on multiple external databases to derive and analyze the data that you need. Need to maintain constant connectivity to a large external database, such as one built by using Microsoft SQL Server. Want to run complex queries. Need many people working in the database and you want robust options that expose that data for updating. Require a flat or nonrelational view of your data (that is, you do not need a relational database with multiple tables). This is especially true if that data is mostly numeric - for example, if you want to maintain a financial budget for a given year. Want to run primarily calculations and statistical comparisons on your data - for example, if you want to show a cost/benefit analysis in your company's budget. Know that your dataset is manageable in size (no more than 15,000 rows).